Why Are There So Many Poor Elderly In Singapore? I was pretty disappointed to read Tan Chuan Jin’s latest Facebook post on the poor elderly in Singapore who work as cardboard collectors. The normal perception that all cardboard collectors are people who are unable to take care of themselves financially is not really true. There will be some who do this as their main source of income. Some do so to supplement what they have. Some prefer to earn extra monies, treat it as a form of exercise and activity rather than being cooped up at home. The word that irked me the most in his status update was “some”. The reality is that MOST cardboard collectors do it for the money not “some”. The usage of the word “some” made it seem like he was trivializing the circumstances of the poor elderly. It is indisputable fact that a large proportion of elderly Singaporeans here are poor. 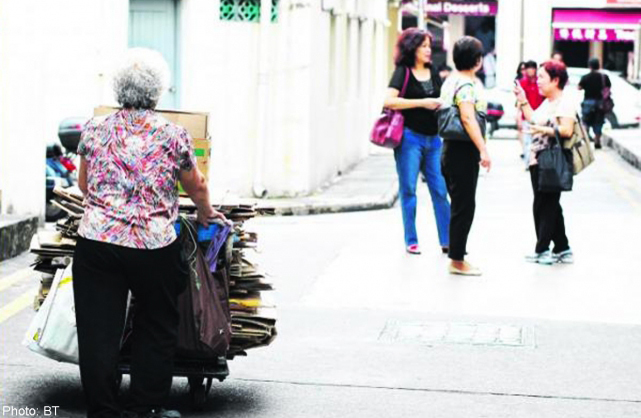 In a 2015 paper on elderly poverty in Singapore, Assistant Professor Ng Kok Hoe of the Lee Kuan Yew School of Public Policy showed that the poverty rate among the working elderly jumped from 13 per cent in 1995, to 28 per cent in 2005 – to 41 per cent in 2011. According to Manpower Ministry figures, in 2016 about 23 per cent of persons over 65 in the formal workforce were earning less than S$1,000 a month. The Singapore Government’s inability to help our elderly people age with dignity has also been criticized by Dr Alexandre Kalache who spent 15 years crafting ageing policies at the World Health Organization. “I am all for active ageing, but if you have never had a decent job, don’t know what job satisfaction is, to make you work till you practically drop dead is not human,” he said. He pointed out that unlike Singapore, much of the developed world already had “non-contributory pensions” for low-income older folk, saving them the indignity of hard labour at a time in life when many may want to retire and rest. Why did the elderly who collect cardboard claim they were doing it for fun or exercise then? According to NUS Sociologist Daniel Goh, there could be more than one reason why a person does it. Another bigger reason was the need for “Face” and dignity. The Singapore culture treats begging as humiliating and values independence and hard work. Singapore has developed rapidly to become one of the world’s most prosperous countries over the past few decades. However, the indicators mean nothing as only a small proportion of people are enjoying this wealth. Our income inequality is one of the highest globally. Most people can’t afford a car due to high COE prices and have no option except for the public transportation which is rapidly declining in standards due to it’s inability to cope with overwhelming number of riders. In contrast to how our other developed counterparts are supporting their elderly, Singapore is doing little. Of course, recently there was also the Pioneer Generation package which was introduced in 2014. It is a little late but a good thing nonetheless. Before their election scare in mid-2011, I felt the ruling party didn’t give a hoot about the poor elderly people. So after their series of welfare measures since then, I truly believe a multiparty system is a good one for Singapore to keep the dominant one in touch with ground sentiments. Many also perceive elderly poverty as the ruling party breaking a central promise it had made to them: “that in return for being obliged to save a large part of their earnings, they would enjoy a carefree retirement”. Thus, I often shudder when others callously proclaim that poor people in Singapore deserve what they got since we’re a meritocratic country because clearly, these senior citizens do not. Our language policy of eliminating other Chinese languages outside of Mandarin has marginalized the senior citizens economically in Singapore as many of them are only able to speak Hokkien; Teochew; Cantonese etc. How does this isolate them? Many are unable to work in the service industry such as receptionists or customer service. Thus, their only options are manual labour which does not involve interaction with others such as picking up scrap cans or cardboards; cleaning tables etc. The lack of language skills also affects their social mobility. They are unable to pick up skills to upgrade themselves. Sure, there are plenty of English and Mandarin courses in Singapore. But, how many of them actually cater to people whose only languages are Hokkien or Cantonese? Even if there were lessons available, poor people would rather spend time earning money than on these things. In other words, the economic situation of many elderly citizens in Singapore are as terrible as migrants from Africa or Middle East who can’t speak a word of English in the UK. Not only are they isolated from economic opportunities, they are isolated in their own families. It is only in Singapore where grand children cannot even communicate with their own grandparents. Singapore claims to embody traditional Asian values and Confucian values in our governance and society. The sad irony is that many of the elderly in our country are living in miserable circumstances. Despite working so hard to build Singapore to the economic success we have today, there is little appreciation for these poor senior citizens. Instead of enjoying retirement, many of them have to pick up scraps from the street and clean up after others. Only one person is credited for all the success we have today and placed on a pedestal. Why are strong Confucian and Asian values like utmost respect for the elderly and reciprocation left out in the process? My take is that the Singapore government only adopts and modifies Asian values where convenient for them such as suppressing freedom of the press and having a single party authoritarian government. I don’t have solutions to this problem but ultimately, as a citizen, I no longer wish to see all the whole wayang “it’s sg50! Let us celebrate the pioneer generation!” campaign or one-off distribution of GST vouchers to win favour. What I hope to see is first recognition that elderly poverty is a key issue that we have to tackle. Followed by more long term initiatives beyond the Pioneer Generation Package which can deliver practical help to the elderly and ensure that these people who contributed to Singapore’s economic success are rewarded. Similarly as citizens, I hope that every one of us can do our part to treat our elderly people in our society with care. Simple things like donating to them; chatting to them; greeting them good morning and of course, speaking up for them when they have no means to. How do you think this problem can be resolved? Share your thoughts below.